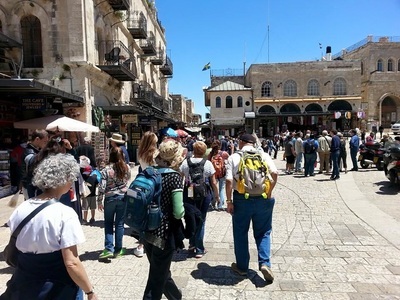 Ben Kellman, our President, declared two years ago that this trip would happen - Rabbi Karen said she was up for it, and Richie Fink and Cheryl Rothstein said they would do the leg work to find a reliable tour company, explore airfares, etc. Cheryl says "It was mostly Richie!! 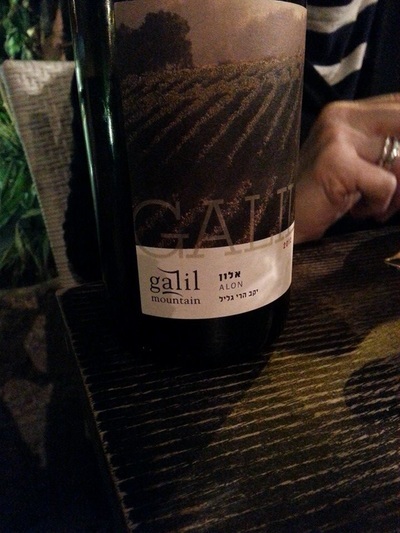 Israeli Red Wine - Ben approves! Ben Kellman and Julie Anderson combined to produce a diary that follows here. Highlighted text indicates you can click there and visit a link to learn about the places that are mentioned. P.S. According to Ben, there is VERY mediocre espresso at Tel Aviv airport, in fact, the same holds true for the entire COUNTRY! Consider yourselves warned! We arrived jet-lagged and rumpled after a crowded overnight flight (couldn't sleep, but somewhat successful at staying mildly dissociated for 10 straight hours). We expected soldiers with Uzis but instead saw families waving balloons that said "Welcome Home" and "I love you!". An airport scene thoroughly steeped in loving reunions, and it set the stage for us to meet our charismatic tour guide Liat, and the other 16 members of our trip, and all the rumples evaporated. We were bused to the Herod Hotel (our driver David will be with us all week), and then we checked into our rooms. We had a jaw-dropping view of the Tel Aviv beach, but we couldn't relax until after a lovely beachside Shabbat ceremony as the sun went down over the Mediterranean Sea, and then a buffet dinner as a group in the hotel. At last, a comfortable bed with the sound of lapping waves ended our 36 hour Friday. AMAZING hotel breakfast before heading north to Caesarea the ancient Roman city that King Herod built to please Caesar Augustus around 70 BCE. We saw beautiful antiquities surrounding the Mediterranean ruins, including a hippodrome where chariots raced and gladiators fought. The echoes of all that excitement about blood made us both a little queasy. Then to the Ayalon institute which was the hidden underground facility that made 2 million bullets under the noses of the British before partitioning. Extraordinary acts of courage and hope. Many Israelis don't know about this since they kept it secret until 1980! Bus ride to Jaffa where at nearly 4 PM, we ate phenomenal falafel and shwarma lunch, then to sculpture of Jacob's Gate, nestled between a mosque, church, and synagogue on highest hill of Jaffa. We walked the nearly 3 miles along the stunning beach back to our hotel. Awoke from longish nap, not hungry so decided on a Saturday night walk, but who should I find in the lobby, but Gur, a friend of my brother who we thought we had missed earlier. Julie and I had delightful cup of tea with him and his wife. Lovely way to end our first full day in Israel. Packed before fabulous breakfast,and got a decent espresso after giving the fellow working the machine detailed instructions on how to pull a meaningful shot. We first went to Independence Hall,where independence was declared by David Ben Gurion. Wonderful powerful post WWII and Partitioning declaration, and preparation for war from 5 attacking non-coordinating neighbors. Many of the roots of current disputes laid down then. We continued up the coast to Eliahu/Elijah's cave. A mystical and spiritual spot that didn't move me. When we got to the Baha'i Gardens we were overwhelmed by the precise beauty they created there,and enjoyed hearing their story from Liat. On to Akko (this was a full day) further up the coast, had another fabulous shawarma and falafel, and then entered the British prison, which held many pre-partition activists. It was most moving for me to stand in the gallows room where these young freedom fighters were hung. Rabbi Karen and Liat arranged for us to recite the Mourner's Kaddish and sing Hatikva. Another ride up the road,where we took the cable cars down the cliffs of Rosh Hanikra. Beautiful grottos, weird movie. We also stood at a border crossing to Lebanon there. Another Long ride, to our lovely hotel at Kfar Giladi kibbutz. Another swell meal, and a good talk about the day with rabbi Karen. We [Julie and Ben] distinguished ourselves this morning by being last on the bus, and Ben had to tell a joke as punishment. (He succeeded brilliantly and may be plotting to be similarly punished tomorrow.) Our first stop today was Tel Dan nature preserve, where a beautiful hike revealed biblical ruins likely to be the seat of Abraham's son Dan. One of those 'wow' moments where archeological evidence corroborates bible narratives. The hike's final stop was a 3400 year old Canaanite gate where we can imagine that Abraham came as he searched for his nephew Lot, who'd been abducted by the wicked king of Sodom. Next stop today was the mystical and ancient town of Safed (aka tz'fot). 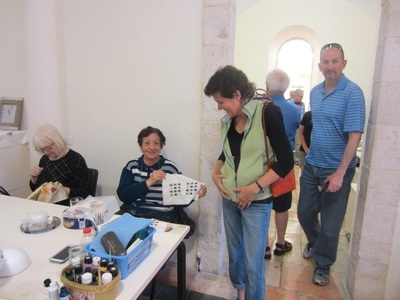 Here we enjoyed the intimate proximity of the oldest kabbalistic synagogue, remarkable artisan studios, and delicious Yeminite food. We saw a colorful bar mitzvah dancing through the streets complete with chuppa, shofar, electric guitar and crowds of families. And then we were yanked into the 20th century as we were driven in jeeps by army veterans up to the Golan heights, and received vivid and passionate recounting of the events of the Six day war in 1967 and the Yom Kippur war in 1973. We stood on the summit of Mt. Bethany. And looked down into Syria as we listened, and then we clambered through underground bunkers to experience how the soldiers fought to defend their border. Then home to our kibbutz hotel and a dinner replete with after-dinner Talmudic discussions of Israeli vs American Judaism and the new Zion. We woke up early enough to go to the hotel gym before having another wonderful breakfast. This was the Christian day, and started with a visit to the Mount of Beatitudes. When the nun wasn't shushing us, we learned about Jesus's sermon on the mount, with its revolutionary message of the poor and meek inheriting the kingdom of heaven. Then we went down the road closer to the sea of Galilee shore to see the church of multiplication, where Jesus fed 5000 (families) with 2 fish and 5 loaves. The rock where Jesus divided the bread was presented under the altar, and was breathtaking in its simplicity. Then we went to Nazareth to see the church of the annunciation, where Mary was told by the angel Gabriel that she would bear God's son. Some of our guys needed to put shawls around their waists to enter the basilica. As we walked up to the 2nd floor, one of our tour members exclaimed "now, this is a church!" Lunch in Nazareth -the wonderful usual: falafel and pomegranate juice, with a gelato chaser. 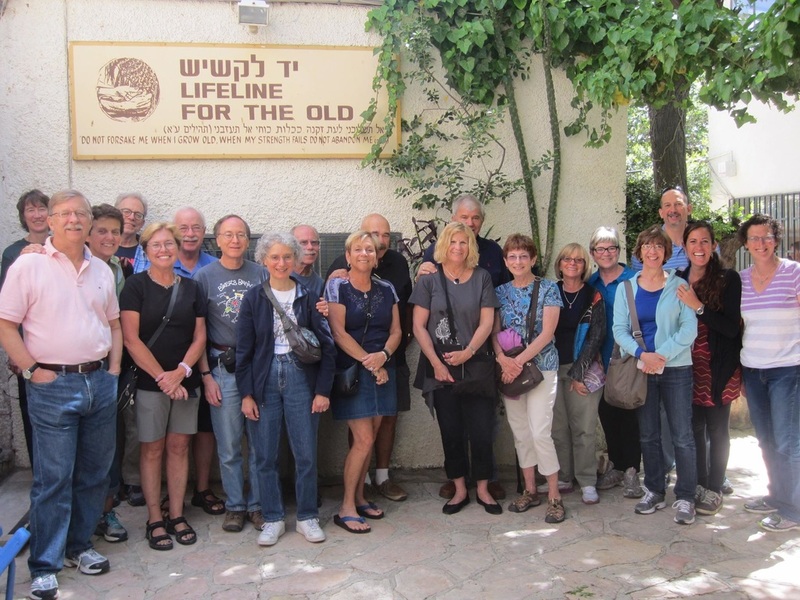 We then traveled back to the sea of Galilee to visit a kibbutz that makes olive oil products. After buying some of those products, we took a "cruise" on the Galilee, where we relaxed and enjoyed the views into Syria and far-away Jordan. We returned home to a quick dinner and then we walked by moonlight along our road lined with paper luminaries into the nearby cemetery. Here we began the day of remembrance that will be observed all over Israel tomorrow [Yom Hazikaron]. The ceremony honored 33 soldiers from our kibbutz who have fallen honoring their country. The 45 minute service conveyed a solemnity that we felt deeply even though it was all in Hebrew. More and more we feel the beauty and joy of this land and these people, over balanced by its war readiness/weariness. Ben feels a deep connection and has not found words for it, and Julie has tremendous admiration and respect for the people's fierce loyalty to this land. This was a day of bus rides through time and political worlds. We left the comfortable flowers and birds of our agricultural kibbutz (Kfar Giladi- See diary entry for 4/19) to drive south. We passed the sea of Galilee, then followed the river Jordan south toward the dead sea. However, we stopped at 2 archaeology sites that I'd never heard of. Beth Alpha, a recovered mosaic floor of a synagogue from 500 BCE. Mostly charming because of its child like designs. There was a great, well done national parks video with delightful reenactments. Then we drove to Biet Shean. As we walked into the park entrance area, we looked up at an area the size of a large modern town, containing an entire Greek-then-Roman city. I mean this was huge! There were underground conduits for water, amphitheater for 2000, swimming pools, market places, avenues, residencies, gymnasia, and the group's favorite, public toilets with seating for 20+ intact. At one point there was a synagogue there, the Jews are certainly a minority there, but we were all surprised because we had never heard of this magnificent ruin. It was preserved when an earthquake 2000+ year's ago broke the pipes and filled the whole site with preserving mud. We were awestruck. Lunch, falafel again, but different again too. 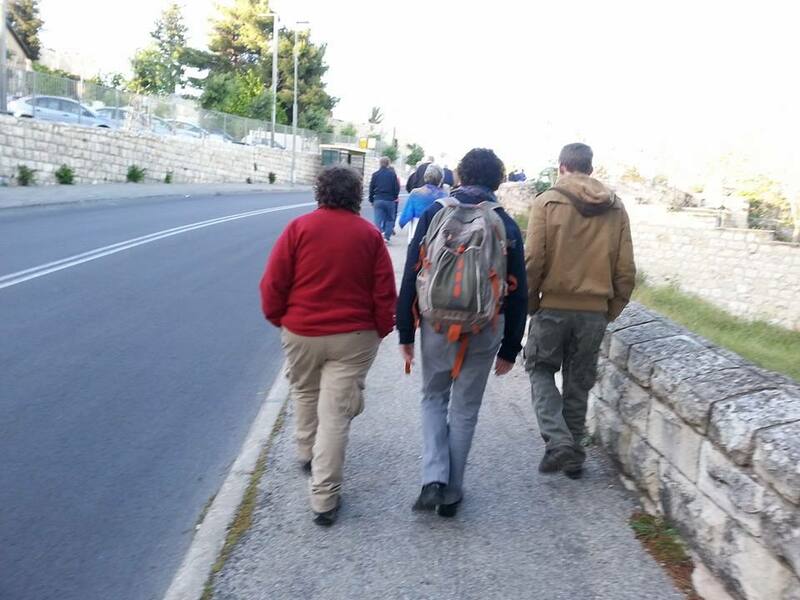 A few of us took camel rides in a parking lot, then on to Jerusalem. We looked out at the old city from Mt. Scopus, home of Hebrew University. Here, we recited the blessings/bruchas thanking God for allowing us to reach this moment, and one for wine, and one for bread. We each shared what was meaningful to us so far on this pilgrimage, cried and laughed, then got back on the bus checking in at the Mt. Zion Hotel in the old city. We had a large group dinner at a nice restaurant in the old train station, laughing and talking and going thru a few bottles of Israeli and Italian wine. The meal cost 3,000 shekels, about $40/person. We walked with Rabbi Karen and Helaine back to our hotel, stopping at a city park where young people were celebrating Independence Day in song. Just like I have always imagined Israel! We walked through the King David Hotel lobby, where matched up orthodox couples were quietly drinking tea hot water, interviewing each other, and deciding if they should get married. Interesting, very interesting. It was quite cool and we walked quickly back to our hotel. Good night. Today we hiked and we "swam". After our typical sumptuous hotel breakfast (latkes and blintzes a delightful addition to the menu) we boarded the bus, bound for the Masada. Again we passed through west bank territory, seeing Bedouin shepherds leading their flocks of goats. Once we reached the Dead Sea, we turned south and once again circled wide around the ancient city of Jericho. This city is now off limits to any non-Palestinian. We noted that the Dead Sea is receding alarmingly quickly, and currently loses 1 meter of shoreline a year. Masada was the first place we saw many armed soldiers. More than half of us hiked the Snake path to the top, which had many sections of stairs. The rest of our group took the gondola . Masada, was built by King Herod around 63 AD, and when the 2nd temple was destroyed in 70 AD 900 of the the remaining Jews from Jerusalem sought refuge there. The Romans followed and attacked this desert fortress. Rather than risk being captured and enslaved, the besieged Jews chose to kill themselves. 10 Jewish men were selected to kill the hundreds and then one of the 10 killed the remaining 9, and then himself. Liat, our guide brought up the question of whether this was suicide or murder, And pointed out how important this discussion was for us on this, Israeli Independence day. As we were leaving, 3 Israeli fighter jets flew over Masada celebrating Independence day. We drove down the coast to the Dead sea resorts. We all experienced a change of mood upon donning bathing suits and entering the sparkling super-salty water, with its famous powers of buoyancy. (Tastes pretty terrible, and gave some of us itchy skin. ) But then we began applying the therapeutic mud from the hotel spa, and soon the whole group was bonding in becoming mud-people happily spreading the stuff on each other. Showers and hot tubs followed, and then we returned relaxed and restored to Jerusalem. Some of our group left and met with relatives and friends for the evening, and the rest of us went out to eat with rabbi Karen leading the way. In the lobby of our hotel, the Mr. Zion, we ran into a group from the Merrimack Jewish Federation, who gave us a ride on their bus to Ben Yehuda St. Karen knows some of the back streets and alleys of Jerusalem, and we found our way up to Zuni, a wonderful restaurant that catered to our hunger and thirst. Near record breaking cold led 3 of us into buying Israeli Defense Forces Hoodies. Toasty warm. More good team building! This day was called Remembrance on our itinerary, and it was well-named. We began the day (again dressing with all we had against the unusual cold) with a visit to the Herzl Museum. Theodor Herzl is revered as the father of Zionism, and in his short 44 year life, he traveled tirelessly through Europe and the Middle East to negotiate with world leaders about his vision of a Jewish state in the land of Israel. He was a journalist whose passion was in theatre, and when he found himself covering the Dreyfuss trial, he felt awakened and inflamed at the prevalence of Antisemitism which was causing world-wide suffering to the Jewish people. He wrote about his dream of a Jewish state ("Altneuland", Old New Land), and although world leaders were at best lukewarm about this idea, Herzl held 6 Zionist Congresses over 7 years that convened burgeoning Zionist associations throughout the world. The first time in 2000 years where Jews from around the world gathered. The museum uses some wonderful technology mixed with Herzl's actual office, and film and soundtrack layovers. Oh my goodness, we have just spent the morning at the Holocaust museum here in Jerusalem, renovated in 2006. Before entering the main space, we entered the Children's Remembrance area, which used mirrors and the recorded reading of names, ages and countries. There were 1.5 million Jewish children murdered by the Nazis. Going through this section was heart wrenching. In the main part, it takes the visitor through the history of the rise of Nazism into the experience of persecution, terror, ghettos and death camps throughout Europe. These were some striking exhibits, with many videos from survivors, original recordings and artifacts. Ben was particularly touched by the beautiful handcrafts the prisoners produced, like a linked chain with prayers, carved from a broomstick. Creativity and art were not squashed by the oppressive boot of the Nazis. The end of the exhibit was about the Jewish underground who fought back and the non Jews who helped save Jewish lives, and how these war criminals were tracked down and brought to justice. The heavy cement architecture powerfully reflected what we were seeing, and the floor changed to a gentle carpet toward the exit, where we came out to a stunning panorama of Jerusalem. There are so many ways to feel terrible about the holocaust. I'm going to take awhile to digest my own responses, but one thing I'm pondering is the interweaving of fear and hope. I kind of get it that fierce determination (aka the Israeli mindset) is a pretty adaptive response to what happened in our own 20th century. Our guides had the good sense to take us to the open market for a chance to eat, bargain for gifts, and for Ben to get his Israeli haircut! Instead of seeking out a synagogue for morning Shabbat services, we decided to go to the Israel Museum, rebuilt in 2010, where we could see the Dead Sea Scrolls and many other antiquities we'd heard about. The contents of these scrolls, from 400BCE, contained the first written example of what would later become the Torah, the Hebrew bible. There were additional scrolls about early views of good and evil, and how these sects or cults practiced. The grounds of the museum are beautiful, and contain many larger pieces of art. One sculpture that captured our attention and hearts was of a women whose arms were raised in supplication, with a child clinging to her back, clearly a Holocaust statue. It was evening, and time for more. We walked just prior to sunset to the Western Wall, in order to be in this most holy place as Shabbat came in. On the way we talked about the barbed wire and boundary fences that still snake their way through this most complicated and beloved city. As we stood in the plaza as a group, we said Kaddish for the loved ones who've died. As the sunset progressed, the activity in the plaza mounted, with feverish chanting and dancing youth side by side with weeping adults next to folks like us. We then separated, so that men could approach to their side of the wall, and women to their separated spot. Men - there were large groups of Orthodox and Chasidic men, dressed in their finest clothing (The hats have a key - Chasidic married men have big round fur hats, up to $5000 each, shinny fedora for single men, and just wide brimmed black hats for all Orthodox men.) Because beloved Shabbat is the most important holiday. I placed a few prayers into a crack in the wall and tilted toward it. I loved leaning my forehead against this ancient rock, chanting the She'ma and thinking of those who I love so dearly and are gone. I prayed for those who need healing and comfort,and felt the loss of those 1.5 million Jewish children who never even had the hope for visiting the "Holiest of Holies". Women - I touched the wall and was struck by it's warmth. The holiest expression I observed was mother's holding their children on their hips while they explained about the wall. As we left the Western Wall, we heard the calling for evening prayers from the nearest mosque, and echoed all over the city as we walked. This really feels like the crossroads of many faiths. Some of us took taxis back to the hotel, where we had a dining room for ourselves with some wonderful Shabbat food, deep laughter, and a sense of what Shabbat is like for us in Jerusalem. "The site is venerated as Calvary (Golgotha), where Jesus of Nazareth was crucified,and also contains the place where Jesus is said to have been buried. Within the church are the last four (or, by some definitions, five) Stations of the Cross along the Via Dolorosa, representing the final episodes of Jesus' Passion. The church has been an important Christian pilgrimage destination since at least the fourth century as the purported site of the resurrection of Jesus." So, this is pretty much THE big deal, and the crowds proved it. Ben was put off by the crowds and the lack of reverence by some of the visitors, and went out and sat in the courtyard after 1/2 hour. Those who stayed with Lesat's tour found quieter places where the spirit and energy could be appreciated. 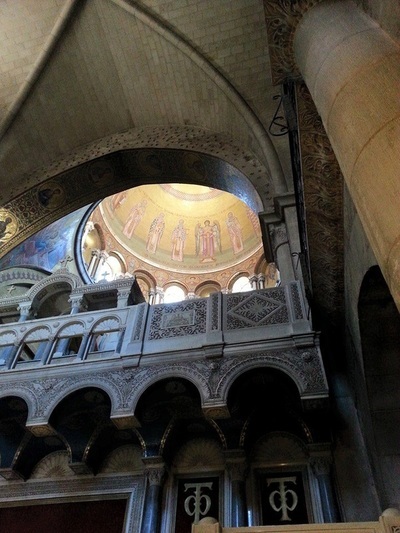 There are many holy items and places, including the stone from under the cross Jesus where crucified , the cave, (surrounded by a small building) where Jesus was buried, and a radiant top window with brilliant sunlight splintering into the darkened church. Noisy, energetic, great food and spices (and a nearly decent espresso) . Great bargains and bargaining. Quiet, beautiful pottery, and we saw a group of Armenian priestly leaders walk by in a procession. Some of us walked back to the hotel, others taxied. A short rest ensued. Before going out for dinner, we met on one of the many verandas of the multi-leveled 5th floor of the Mt Zion Hotel. Rabbi Karen brought printouts and Helaine had bought a Havdalah candle. It was especially moving, as we looked out on Jerusalem and the hills of Israel, and recited Kaddish, after naming someone we have lost. It was as if the very air we were breathing understood our sorrow, on this trip that was so rich for us. Rick read a poem he'd written which brought all of us to tears. It is kind of hard to get a table for 20, but we kept doing it. The food here was good, the wine even better, but the kitchen got behind on some of our orders, and a couple of us didn't get our food. They were able to find a kind of resolution. Again, some of us taxied back to the hotel, and a few of us enjoyed the 40 minute walk thru this vibrant ancient Jewish city. On this our last day in Israel, we are cramming in many sites in Jerusalem. We just finished touring the Hadassah medical center's synagogue, for which Chagall created 12 stunning windows. They were damaged during the 1967 6-day war, and Chagall in Paris, famously responded to the damage report by saying "you take care of the war, I'll take care of the windows." He repaired one to include the shrapnel hole. Then we were given a presentation about the history of Hadassah, which was formed and guided by strong women who believed in building a hospital for the new state of Israel. From the mid 50's forward, they guided fundraising in America which resulted in this magnificent medical center and now medical school with a specialty in tank burn trauma. Ben kept looking for a mention of his Mom's Hadassah organization in Brooklyn, as he remembered the many fund raisers she and her friends worked on. And, most amazing to some, Hadassah played a big role in transforming Hebrew from a shelved language used only for Torah readings into a street language that now everybody speaks naturally. And then, we visited a day center, the Yad Lakashish Workshop, for "people who are old and in need" where there are art and artisanal studios, and we all went nuts buying their lovely silkscreen, metalwork, paper mache, and jewelry products. It was a very sweet place and a hopeful one, where diversity was accepted warmly and space and support are provided to disenfranchised people. Under the Temple Mount, King Herod, in 19 BCE, built a wall to double the size for the Second temple to rest on. We went and walked down into this tunnel which includes HUGE cut and fit rocks, the biggest over 40' long, 12-13' thick and 15-16' high, weighing over 500 tons and fitting perfectly with other giant cut stones, creating a very flat and perpendicular wall. Amazing engineering. Also, there is a place to for women to pray, which is the closest you can get to the Holy of Holies. There are water pools and culverts down here. We came up and had another magical lunch of falafel for 3 of us, while everyone else opted for bagels or pizza. A few hours doing last minute shopping in the Jewish quarter, and then on to our last meal together in a Dairy kosher restaurant. The high point, beyond the food, was everyone mentioned something(s) they gained/learned from the trip. One that we all agreed with was from Rick's poem " I came here looking for answers, and am going home with more questions." We gave added tips for our wonderful tour guide/new friend, Lesat, and amazing bus driver David, and a small gift to Richie for the thoughtful organization and the follow-thru from my dream. At the airport at 9 for our 12 hour flights back and then a connection at JFK or Newark and then home. 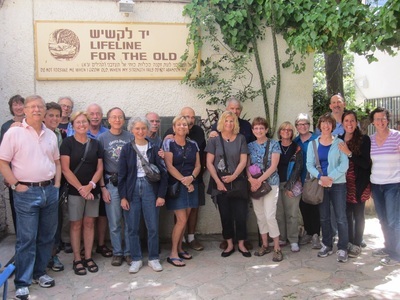 A wonderful group to travel with, new friends, with new insights into old relationships. Aside from the depth of learning/seeing/feeling about Israel, we had built a strong and connected community. It doesn't get better than this. From the moment we were in Israel, I was looking for a piece of olive or eucalyptus wood to take home and make pens from, hopefully one for everyone on the trip. I found a piece of wood with orange-brown heartwood, unknown to me but could be researched when home, maybe bot olive or eucalyptus, but nice looking. It was too long to put into my suitcase. Everywhere we went, I asked for a saw, with quizzical responses. Finally, I thought we could get one from our hotel maintenance on the morning of our departure, but alas, it was not meant to be. I will be buying some certified Israeli olive wood shortly.